This frame features a set of authentic Patrick Kane 2009 NHL All-Star jersey numbers which have been personally signed by the New Jersey Devil star himself. The numbers in the frame are game-ready numbers, the same as you would see on any officially licensed jersey. Hall was drafted 1st overall in 2010 by Edmonton. Hall has come off a career year in 2018 putting up 93 points in only 76 games to win league`s MVP award (Hart memorial Trophy). Taylor Hall broke two of Gretzky`s records in Edmonton. First, the fastest hat trick from the start of a game (12:38). His second record broken was when he scored the fastest back-to-back goals in 8s. Gretzky no longer had to fear any of his records to be broken by Hall in Edmonton when he was traded to New Jersey at the conclusion of the 2016 season. 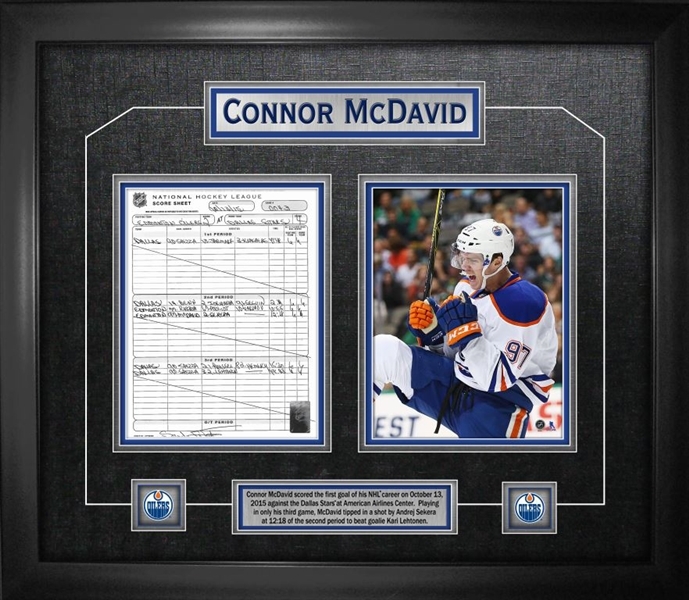 The NHL & NHLPA licensed product is accompanied with a Frameworth hologram and COA to ensure the authenticity of the autograph. Frameworth is the exclusive provider of Taylor Hall signed memorabilia. Finished Size: 18x26".